A hot new buzzword is green living. How do you live a sustainable lifestyle? DW presents an automatic listing of content around the topic of green living. Ironically, organic fruit and vegetables are often packaged and labeled with plastic. But such unnecessary packaging and plastic stickers could be replaced by an innovative laser mark. Will it catch on? 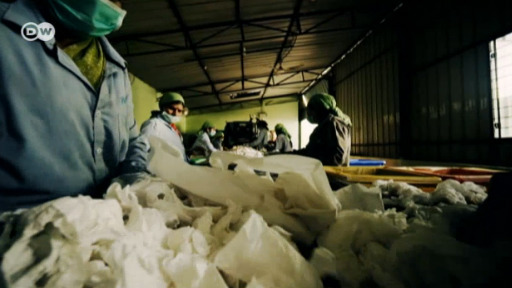 India's economy is growing - but so is its waste problem. Garbage is piling up in the nation's urban spaces due to the lack of efficient disposal systems. Now entrepreneurs are tackling the problem. You might think climate scientists are doing enough for the planet through their work. But some are trying to live more sustainably by offsetting their CO2 in various ways. Their credibility is at stake, they say. Nneota Egbe is a veteran host at eco@africa. He reveals what he's learned in that time, describes some memorable moments and explains what Africans and Europeans can learn from each other regarding the environment. Eco-advice can be overwhelming — and often ineffective. So if you had to pick just five things to go green on, what's the most you could do for the least amount of effort? The first pictures of earth from space, the first bicycles on earth, trash problems in the Mediterranean Sea, waterways changing color and controversial logging laws - a look back at the week in environmental news. The German capital is hailed for its green spaces, where Berliners flock at the first glimpse of sun. Check out insider tips for the best nature hangouts - and find out if Berlin really is as green as people say. On this week's Living Planet: From sourcing superfoods to combating food waste, we explore the weird and wonderful ways people are living green.